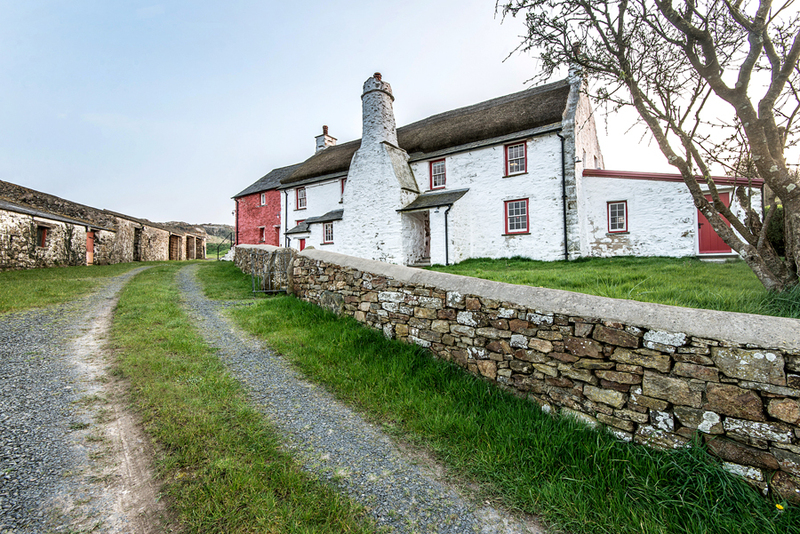 Rhosson Farmhouse is a stunning detached grade 2 star listed stone farmhouse, dating back to the 15th century, set yards from the Pembrokeshire Coastal Path and sea at St Justinians near St Davids. 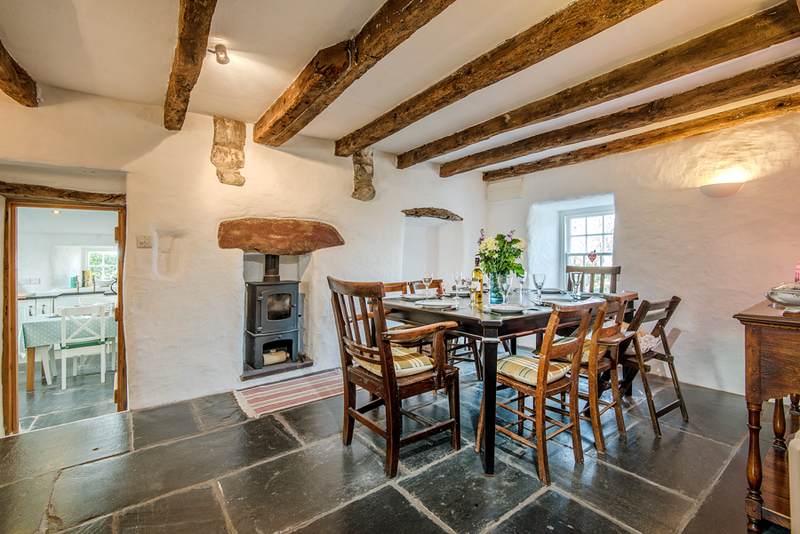 It has been lovingly and beautifully restored using traditional methods and retaining the original features including a wonderful thatched roof and distinctive flemish chimney. 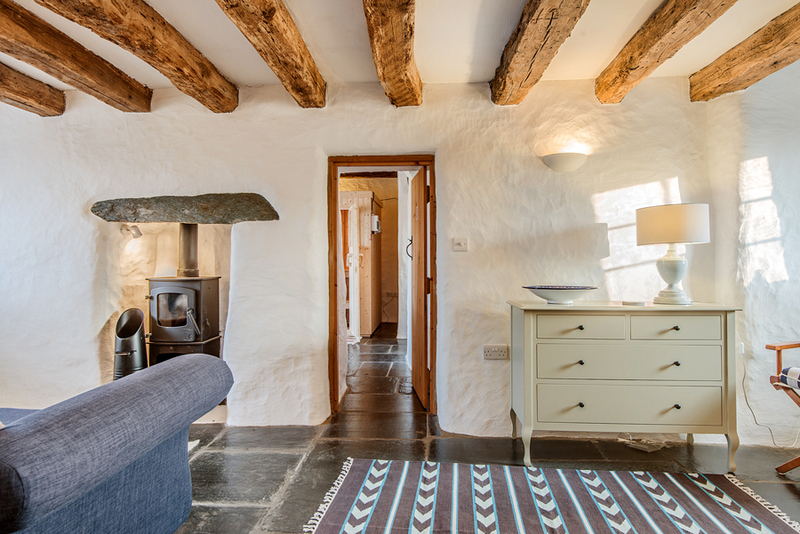 Finished to a high standard and furnished in a mix of contemporary and antique pieces, it makes a fantastic holiday home, with restored beams, white washed and exposed stone walls and quality slate flagged floors. 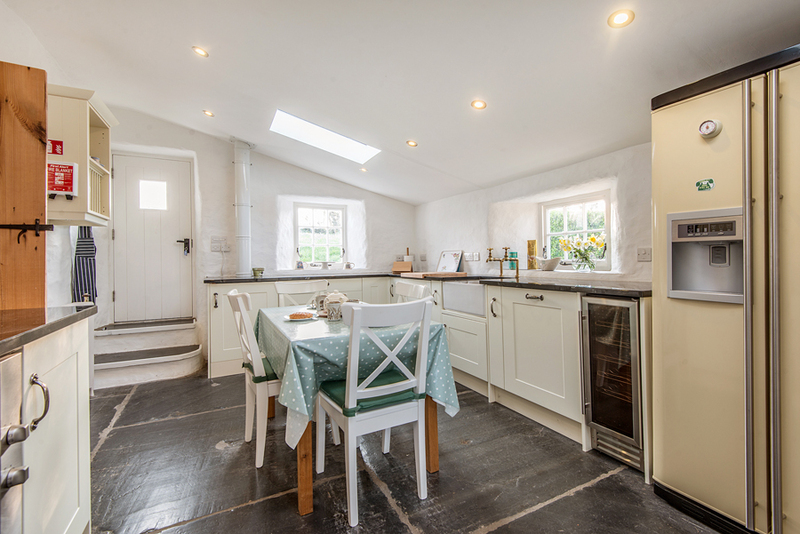 The beautifully fitted cottage-style kitchen with all mod cons will certainly delight any cook, 2 steps lead up to the formal dining room with wood burning stove. 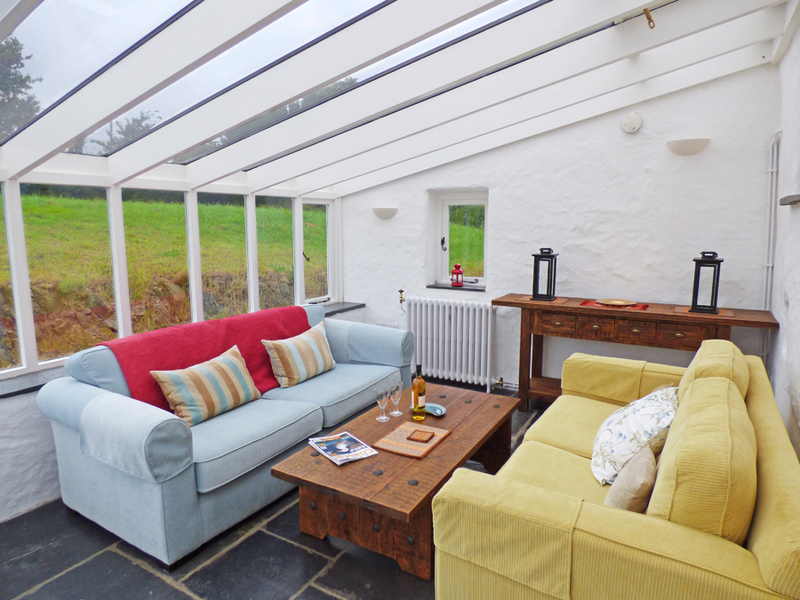 The large main sitting room has a distinctive Inglenook with wood burning stove to ensure a cosy feel on the chilliest of evenings, the second sitting room and wonderful light spacious conservatory provide plenty of space for families to relax. 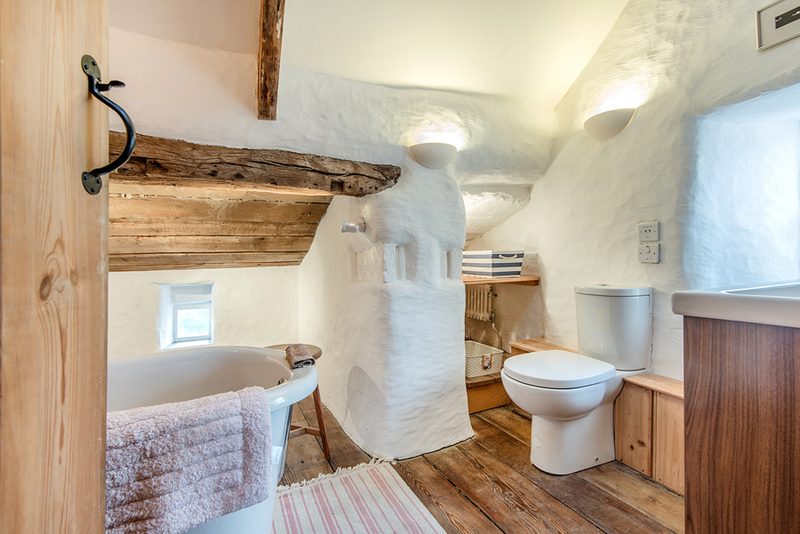 The sauna is sure to be a favourite and the original stone stairs lead to a bedroom in the eaves with A-frame beams and a door leading out to the restored barn steps that drop down to the garden; the views from here are super. The main staircase leads to the other bedrooms all equally charming with beams, wooden floors and high-appointed bathrooms. French doors from the conservatory lead to the fully enclosed, lawned garden with sloping lawn that stretches to 1 acre. 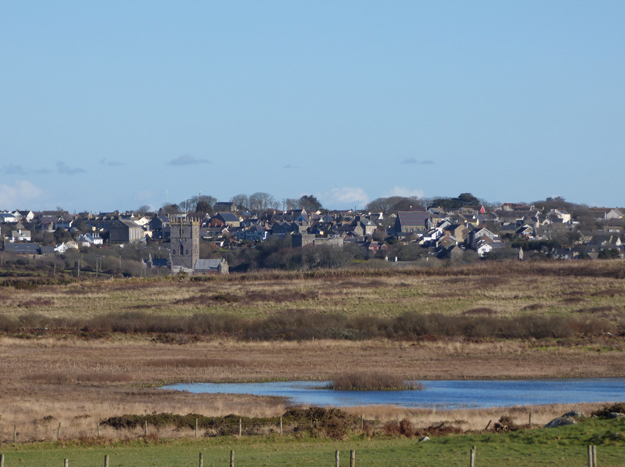 Enjoy an alfresco meal on the sheltered gravel terrace or at the top of the lawn, the views are absolutely stunning and panoramic over the fields to the sea, Whitesands Beach and St Davids - magnificent! 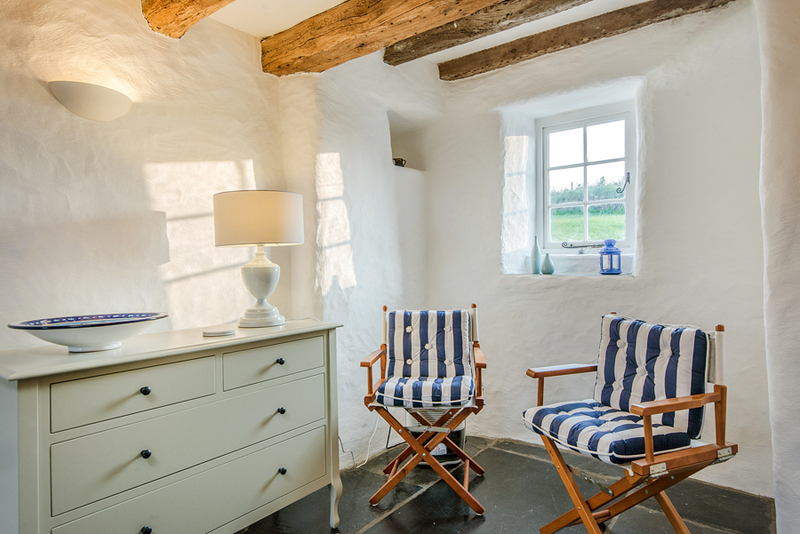 Set just yards from the Pembrokeshire Coastal Path and a few minutes’ walk from St Justinian’s, the departure point for boat trips to Ramsey Island. It is perfect for exploring this wonderful coastline and in September a trip to see the seal pups is a must of any holiday. 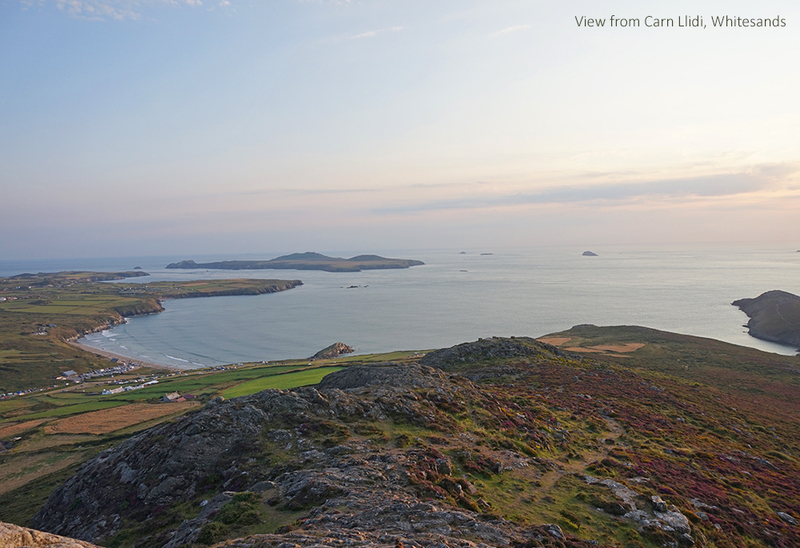 Whitesands beach popular with families and surfers both beginners and professionals alike is approx 1.3 miles away, while the tiny city of St Davids with its Cathedral and Bishops Palace is just under 2 miles away, enjoy exploring its shops, pubs, restaurants and galleries. 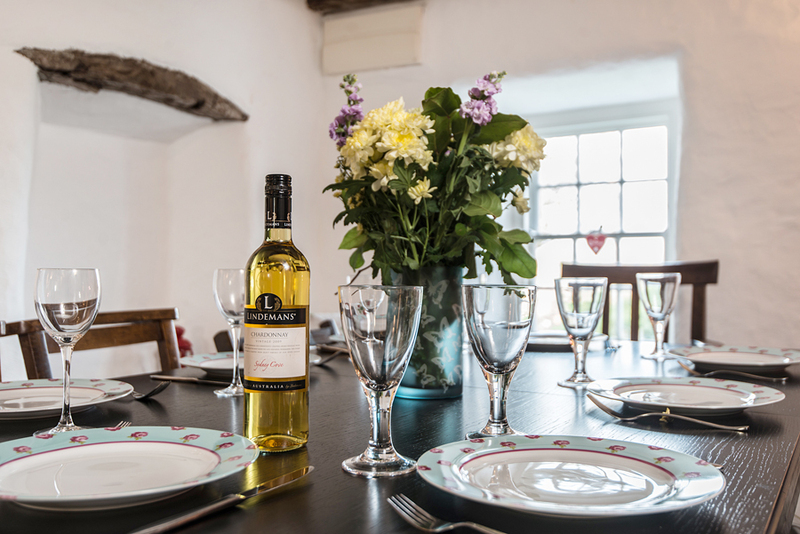 Rhosson Farmhouse is sure to become a firm favourite with holidaymakers whatever the time of the year. Care needed as narrow stone staircase. 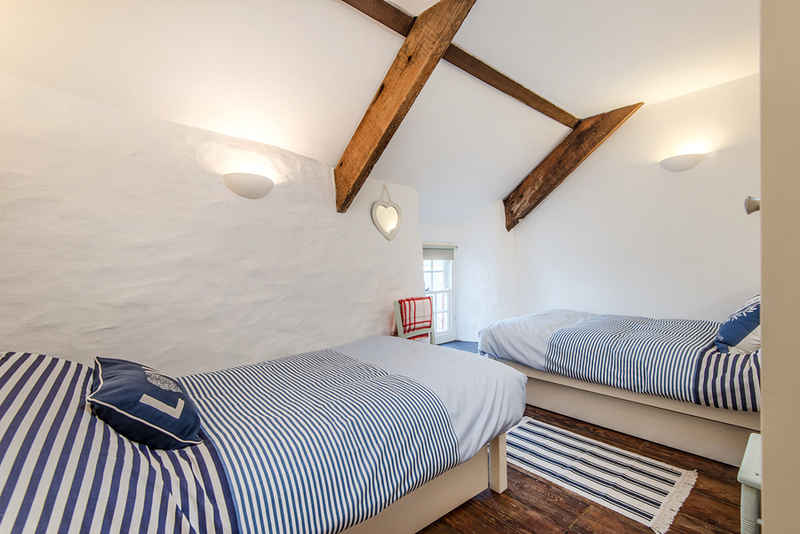 Available to sleep smaller parties of 6 - please call 01437 767600 or 01437 765765. 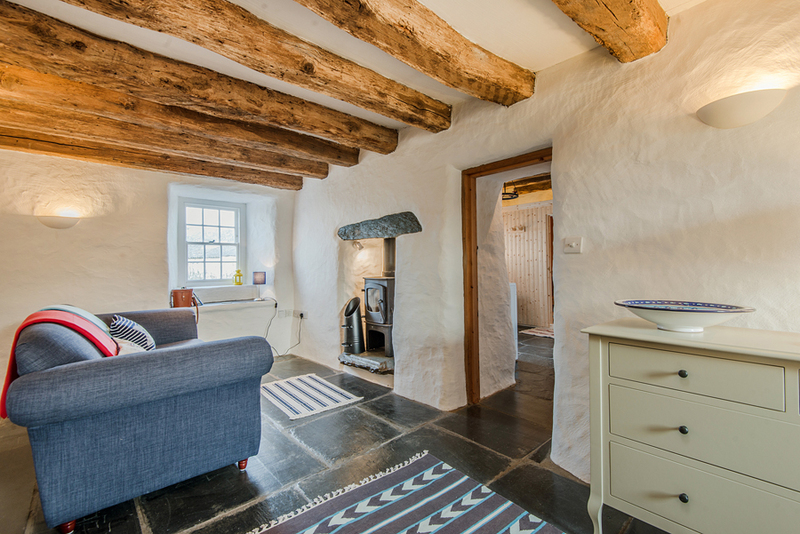 Ground Floor: Unglazed porch, hall, narrow passageway to cloakroom/whb/wc, sitting room, 1 step up to conservatory, dining room, 2 steps down to kitchen, second sitting room, sauna in relaxation room, wet room/whb/wc, narrow stone staircase to first floor. First Floor: Double room. 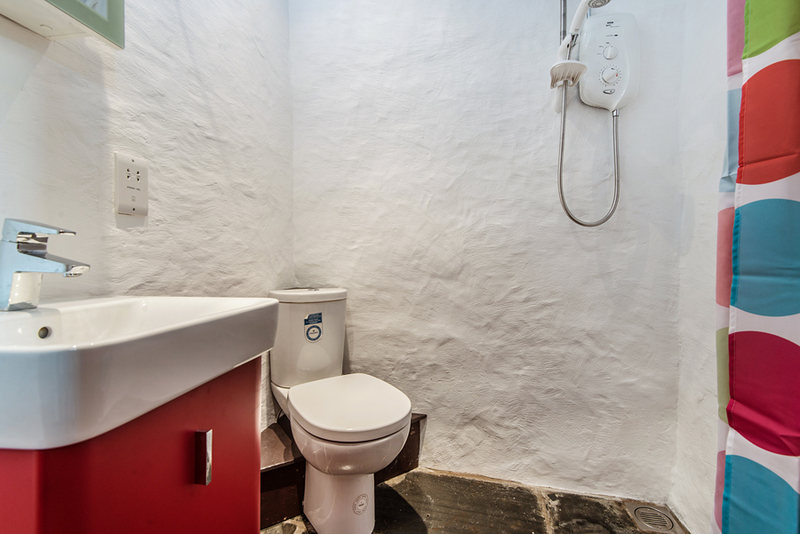 Second access to First Floor via main staircase: Double room/ensuite bathroom/roll-top bath/shower attachment/whb/wc, twin room, bathroom/overhead shower/whb/wc, double room/ensuite shower room/whb/wc. Heating: Oil central heating, 3 wood burning stoves - starter packs provided, further logs available with honesty box. Electricity: & Oil: £40 per week September - May, £20 per week June, free July and August. 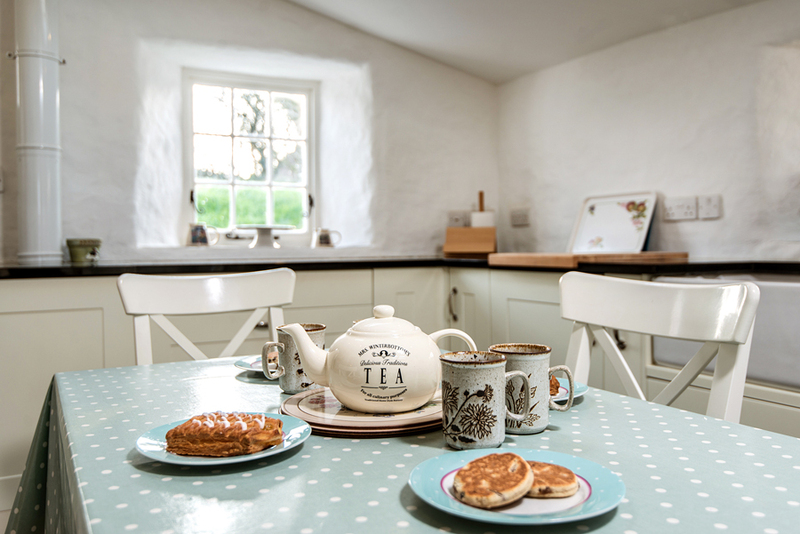 Facilities: Electric induction hob, large oven, microwave, American-style fridge/freezer, wine cooler, dishwasher, washing machine, 2 TVs, DVD player, WiFi, towels, sauna charged according to use with complimentary 2 hours, garden furniture. Secure storage in outbuilding. First established in 1869, the St David's Lifeboat Station is situated at St Justinians and is operated by the Royal National Lifeboat Institution, a charity mostly funded by public donations. Currently, construction is underway for a brand new lifeboat station alongside the existing lifeboat station, which will hold more modern and improved facilities and equipment, as well as easier access for the crew and delivery of kit. The current station can be seen from the nearby coastal path, or you can even walk down the concrete steps however inside access is not available. You can however visit on special occasions to see the launching of the lifeboat. 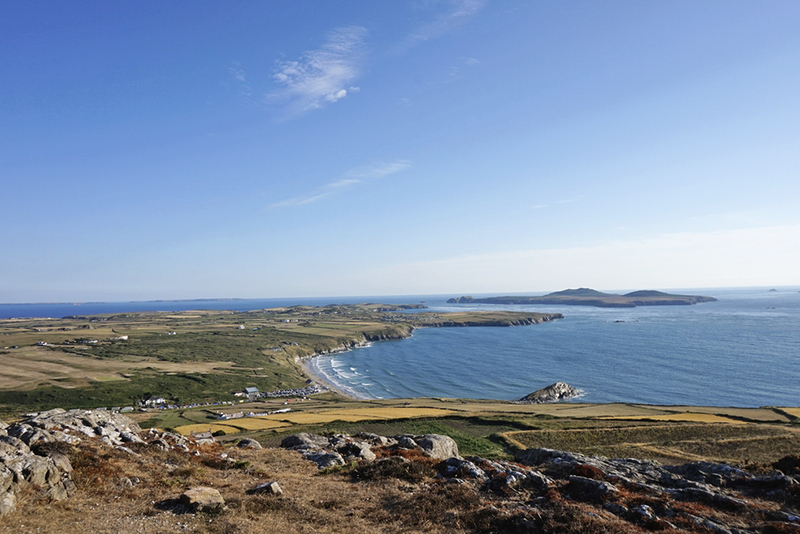 Ramsey Island is a popular RSPB Nature Reserve situated offshore of the St. David's Peninsula, and can be accessed via a number of Boat Trips which are able to land on the island or cruise around it. The island is brimming with wildlife particularly bluebells and purple heather, as well as sea-birds such as guillemots, razorbills and choughs. 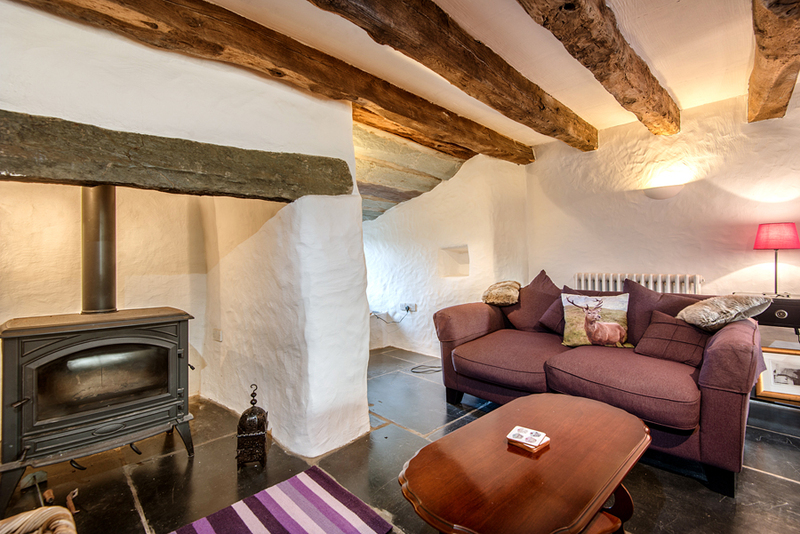 We spend a week in this delightful cottage. 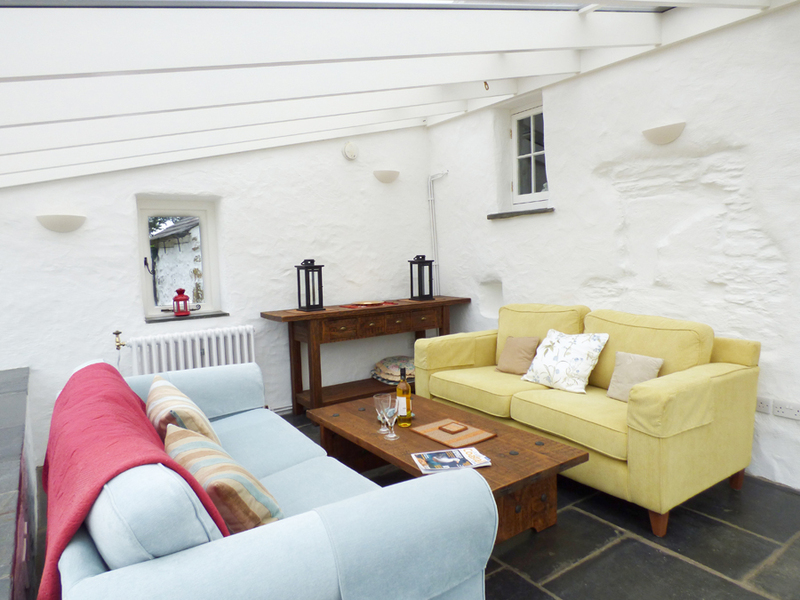 It has been beautifully converted into a modern home but retaining its character. 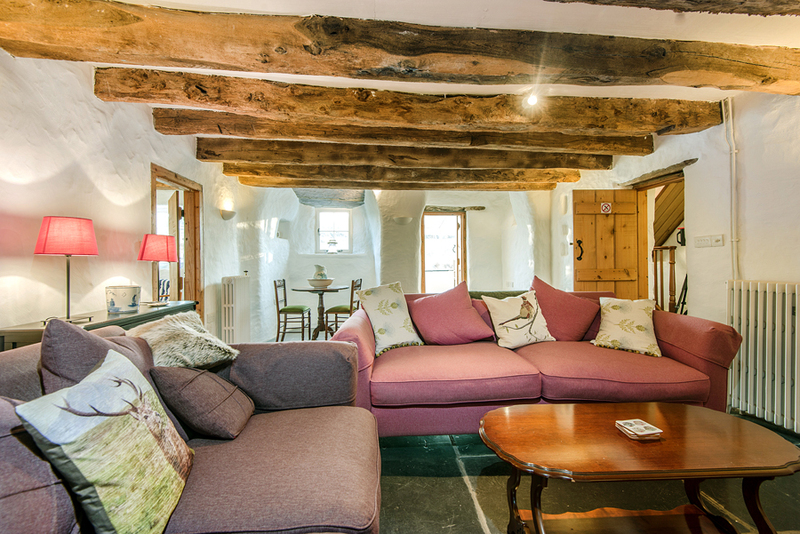 We never tired of looking at the nooks and crannies and beams! 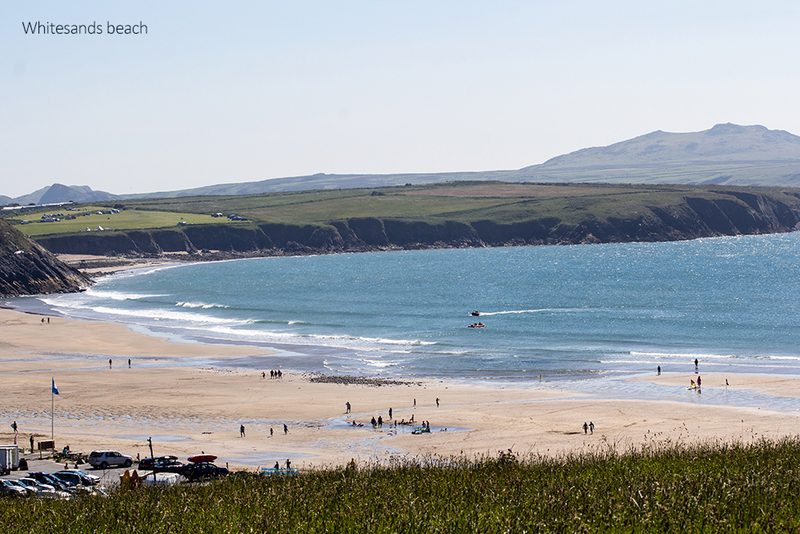 The location is convienent for all that this part of Pembrokeshire has to offer. First class! Rhosson Farmhouse is approached via an A-road. The property is easily approached day and night although visibility can be poor in the night. The property is accessed by a gated front. Take care while opening the gate and be careful of the road as it is busy during the summer months. 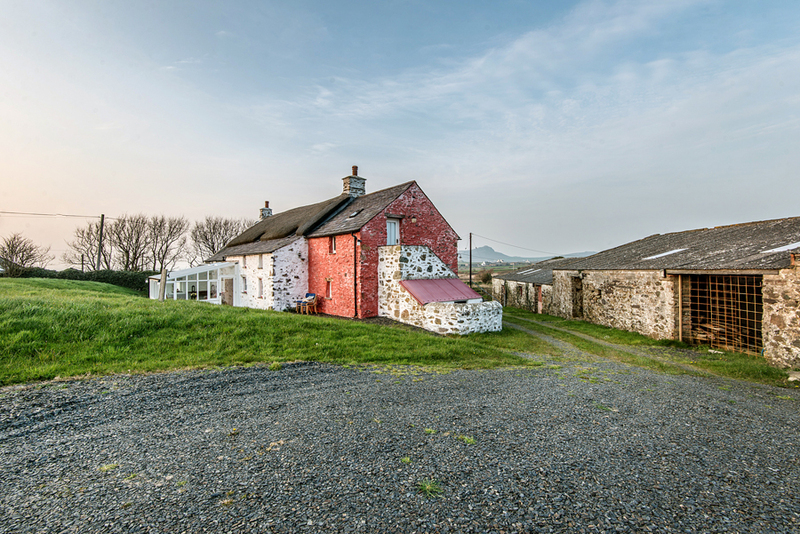 There is ample parking at the property provided by crushed slate driveways. Level parking is available to the left of the main gate and further parking is available at the top of the driveway where there is a big opening which is level providing ample parking for several cars and plenty of room to manoeuvre. Avoid driving on the grass as this can be wet and slippery during the winter months and could damage the grass. Take care whilst driving on the tracks as you make your way up the slight slope to the parking area at the top end of the house. The entrance to the property is in the middle of the house to the right of the chimney and is approached by a walled fronted lawn area with a gate. There are 2 steps at the gate about 7 inches high. These steps are easily negotiated and are about 3 ft wide. Follow the path to the front door which is accessed by a porch and a further 3 steps which are graded in height and in order they are 4”, 5” and 6” high on route to the front door. All the steps are about 3 ft wide. There is a seat in the porch on the right hand side. On entering the property through the front door which is about 35” wide and 6ft high, the light switches are to be found on the wall on the left hand side. Take care while accessing the property as the porch is dark. The lawn areas around the property extend to about an acre and are steep in places. Take care in these areas especially if the ground is wet! Garden furniture is found around the property both on the crushed slate area at the back of the property and on the lawn areas. The outbuildings are private and access is prohibited. They are secured with locked wooden doors and wire fencing. Take care of your pets in these areas. There are three piles of stones visible at the perimeter of the property. 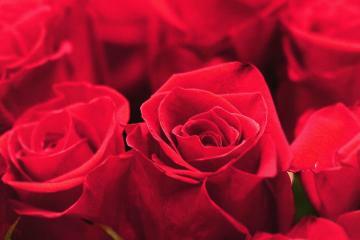 Take care around these and avoid climbing over them as they liable to move. In the front lawn there is visible cover for the sewage treatment plant. Please do not stand on this as it is not weight bearing and could collapse if walked on. At the back of the property there is a submerged oil tank noticed by its green top. Please avoid stepping on the lid. There are a series of outside taps and electric sockets that may be used. Take care to switch off all electric sockets after use and turn off all taps firmly. At the end of the main building there is a redundant pigsty entered by a gate. Please avoid using this area. 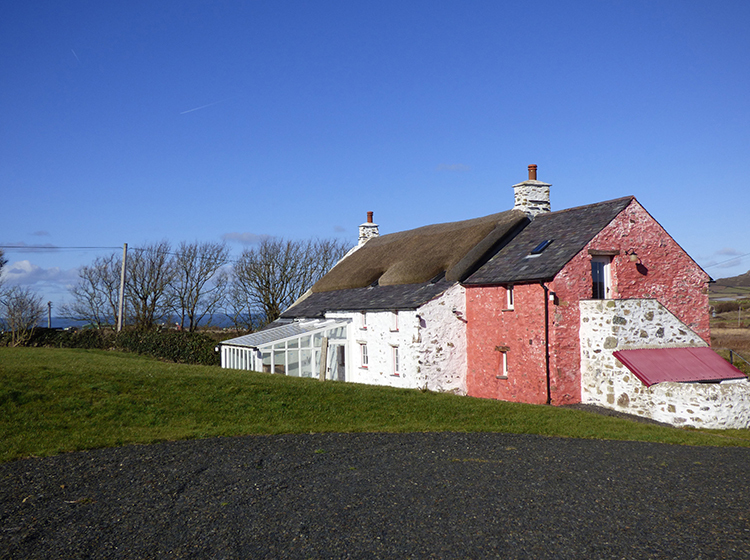 Outside fires and barbecues are prohibited as the property is not insured for these due to the thatched roof and could prove hazardous. 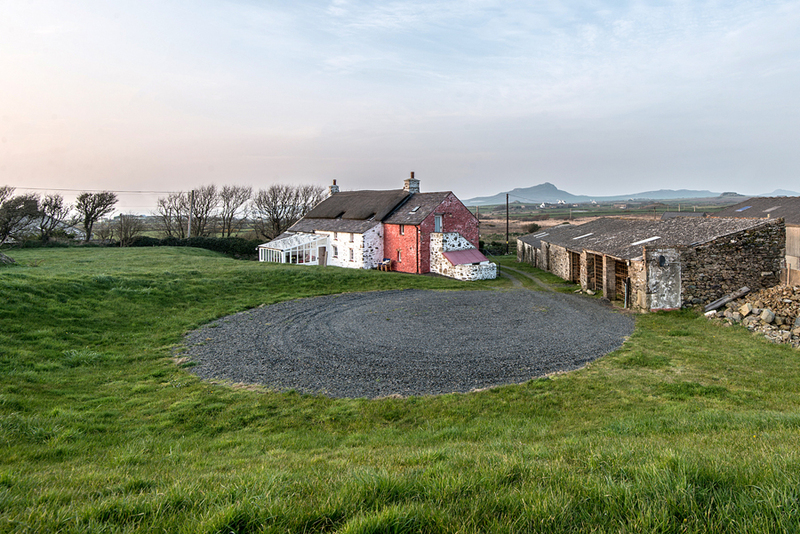 The boundary of the property is secured by a mixture of wooden fencing, sheep net fencing, hedges, stone walls and the outbuildings. Take care with pets as the boundaries may have openings allowing animals to enter and escape. Kitchen door – to the far right of the property – about 29” wide/67” high – approached by a level crushed slate path accessed from the main path to the front door. There is one step up to the door – about 7” high and 35” wide. Stable door – to the left of the main entrance – outside the walled front area and approached from the crushed slate driveway – the entrance step is 1” high and 52” wide. The door is about 3ft wide and 70” high. Rear kitchen door – approached from a level crushed slate area that surrounds the back of the house and one step up about 5” to the door which is about 34” wide – two steps lead down into the kitchen from this door – about 2.5ft wide and 8” high. Conservatory door entrance – about 31” wide and 76” high – again approached via a level crushed slate area and level/even slate step outside which is about 4ft wide. Upper stable door entrance – accessed by 12 steps leading up the side of the stable next to the pigsty. The steps are very uneven, about 33” – 39” wide and 6 – 9” high with a 90 degree turn in the staircase – there is a handrail on the lower part of the staircase. The entrance door is about 28” wide and 70” high with an 8 inch step high/33” wide step leading in to the building. All the entrance doors have slate steps or platforms outside and the step over the door frame varies up to 3” in height. To the left hand side of the chimney in the front walled garden there is a small store which is accessed by a small door on the side – about 30” wide and 57” high – this door is approached via the front garden. 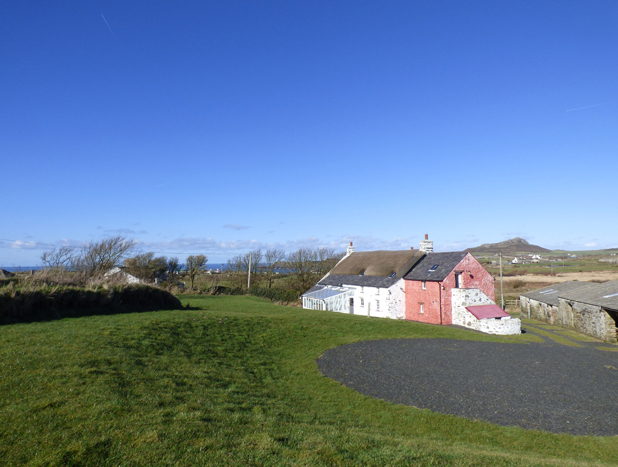 As well as the main gate in the front wall there is a side gate also – opposite the small store and from this gate the path leading to the store is even and laid with crushed slate. Inside the store is the main fuse box, the control panel for the sewage treatment plant and master socket for the phone line. There is a light switch on the right hand side wall. The front lawn has 2 lights in the ground which shine up at the house. At the upper end of the outbuildings attached to the pine end wall there is a satellite dish about 80” off the ground. The ground floor comprises of kitchen, dining room, passage-hallway, main lounge, parlour, sauna room with shower/wc and conservatory. 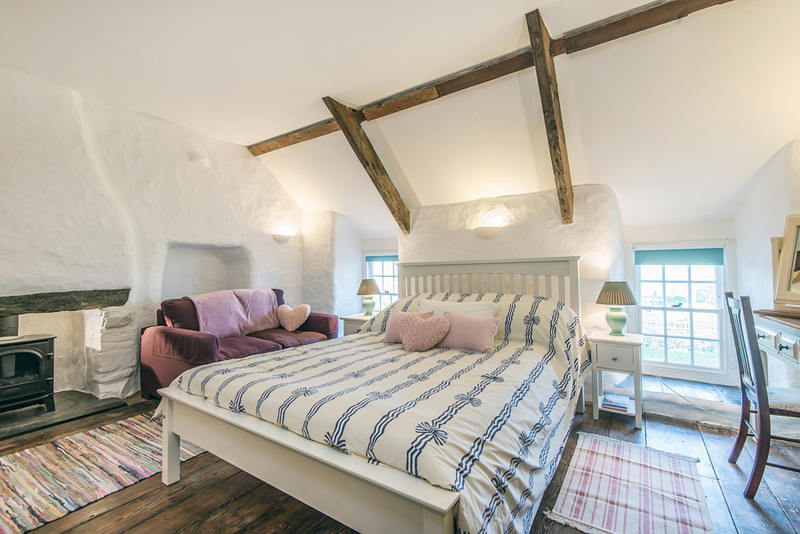 The first floor comprises of stairs, landing and hallway, airing cupboard with tank and heating controls, en suite bedroom with bath/shower, en suite bedroom with shower, bedroom with twin beds, separate bathroom with bath/shower and a bedroom above the sauna in the stable. The ground floor is laid with slate and is all on one level except for the kitchen and conservatory. The slate floor can be slippery when wet. There are anti slip rugs scattered around the rooms on the ground floor. To access the kitchen from the dining room in the main house there are 2 steps down which are marked – the first step down is 5” high and the second step down to the kitchen is 7” high. Both steps are 29” wide. To enter the conservatory from the main lounge there is a wide step up which is marked – it is about 5ft wide and 6” high. The darkest rooms in the house are the dining room, main lounge, parlour and sauna room, but there is ample lighting available. 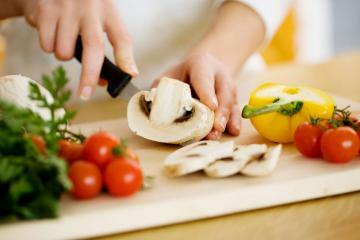 Kitchen – a light kitchen with plenty of room to move around. Two steps lead up into the dining room via a door 26” wide and 71” high. Two steps lead up to the back door of the kitchen. Electric oven/hob with ample work surfaces and large butler sink. An oil condensing boiler is situated next to back door providing the central heating for the property. 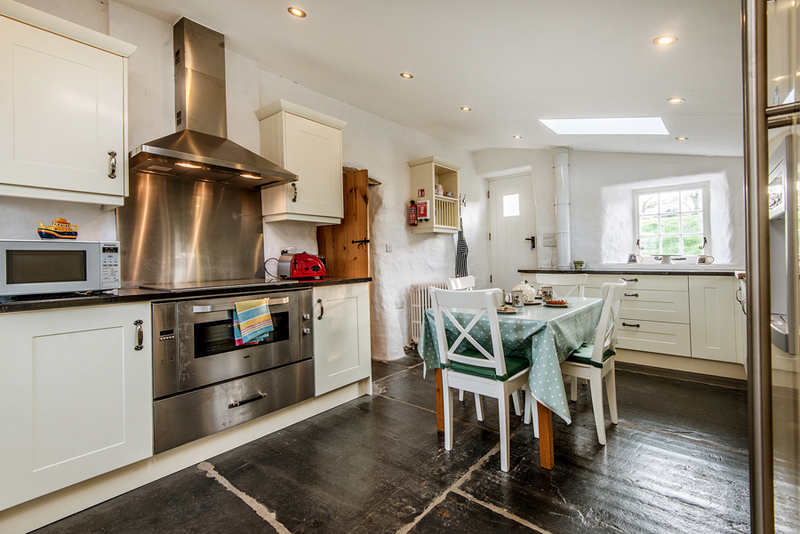 Other appliances include fridge, wine cooler, dishwasher, washing machine, toaster and kettle. Ample storage for cutlery. 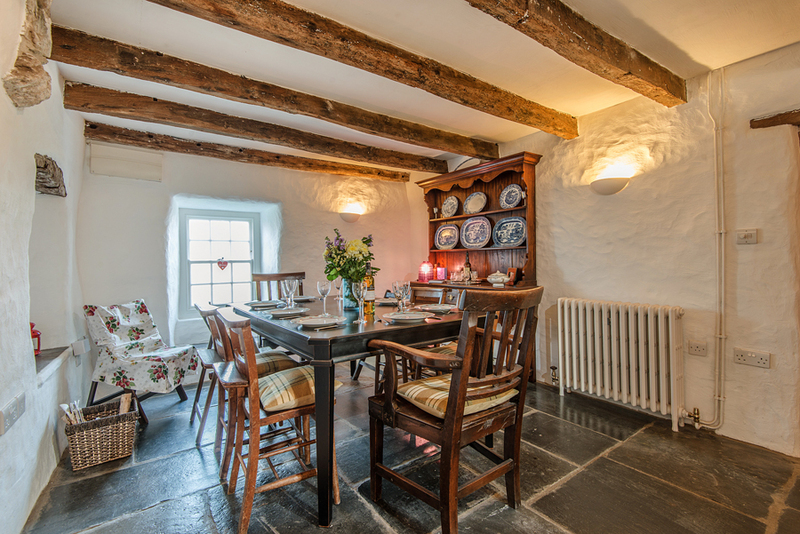 Dining room – has a multi-fuel stove. 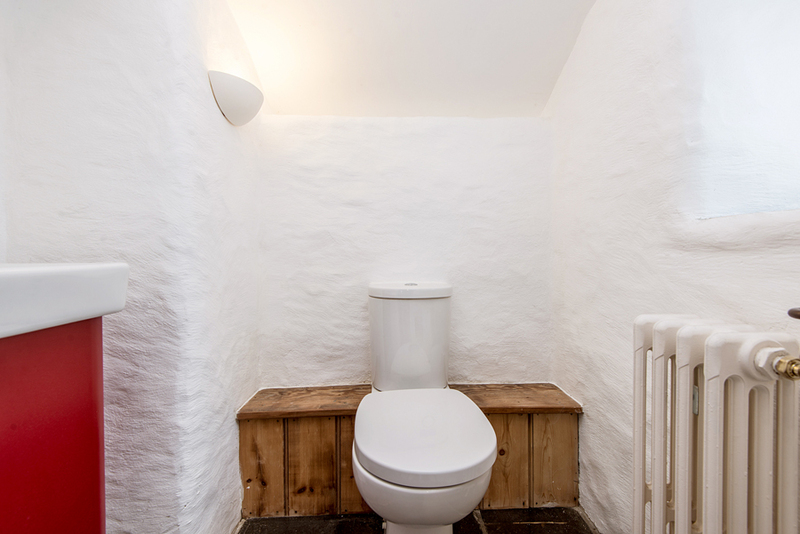 A narrow access passage to a rear toilet which varies between 16” and 2 ft wide and between 68” and 6 ft in height with a small slate incline leading up to the door of the bathroom which is 2 ft wide and 76” high. 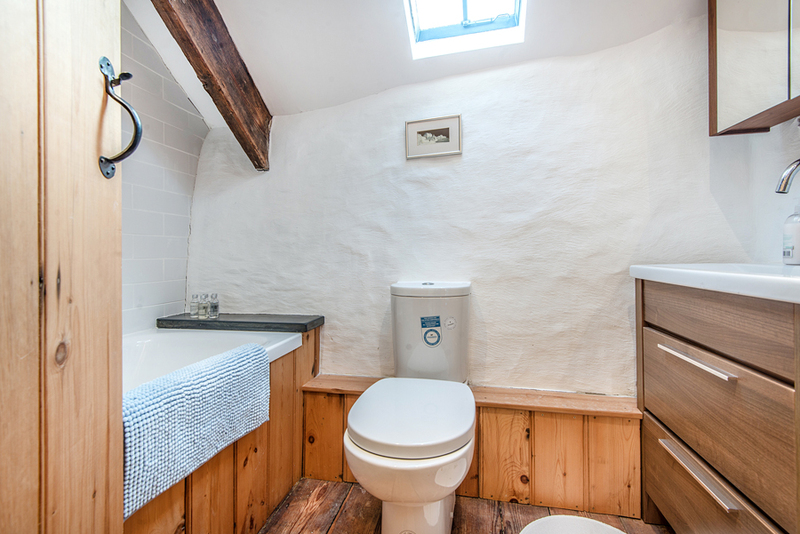 This is a small functional bathroom with good headroom. Passage – hallway – a wide passage varying in width between 39”and 4ft and 16ft long leading up to the staircase. A doorway on the right leads into the dining room about 28” wide and 68” high and a doorway on the left leads into the main lounge about 26” wide and 69” high. There is some open storage available under the stairs, but the access is awkward. 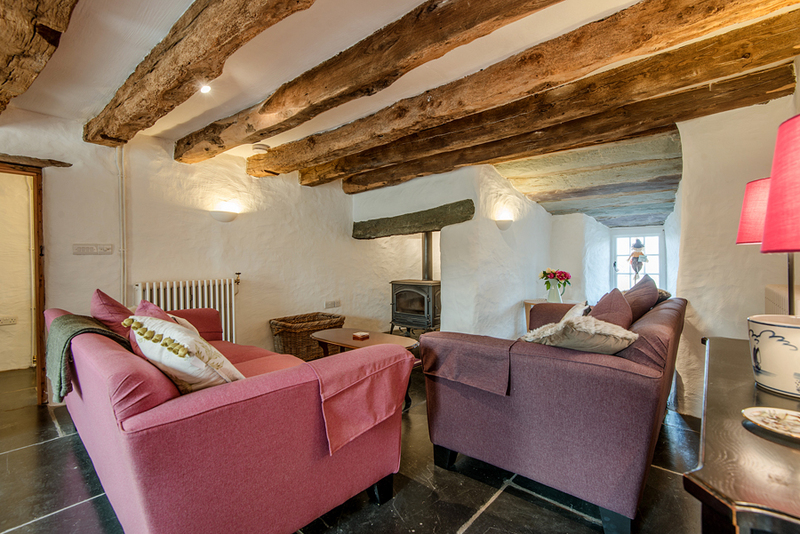 Main lounge – this is the largest room in the farmhouse. 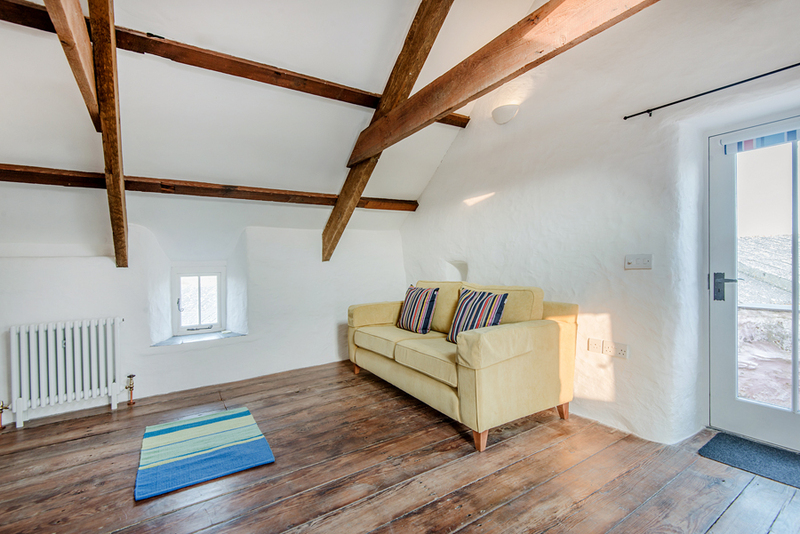 The room has many features, it has a wood burning stove as its main feature with plenty of seating areas. A door leads from the main room into the parlour and a door into the conservatory at the rear. The door leading into the parlour is about 68” high and 27” wide and the door leading into the conservatory is about 67” wide and 27” high. There is 6” step into the conservatory which is marked and visible. The TV and CD player is situated in this room, both have remove control options. 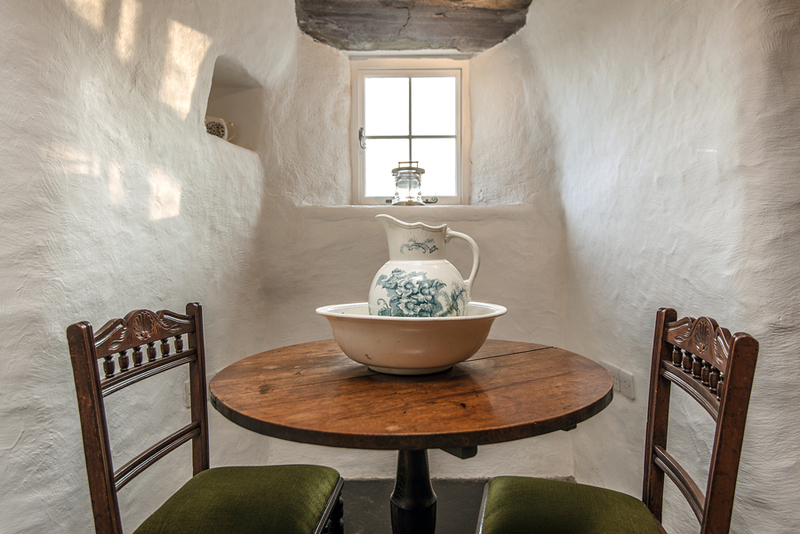 Parlour – this has a multi-fuel stove which is the same as the one in the dining room. 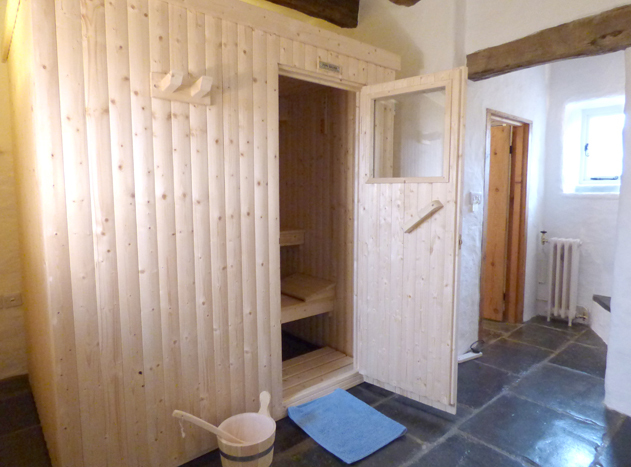 From this room there is a doorway leading into the sauna room which is about 27” wide and 68” high. 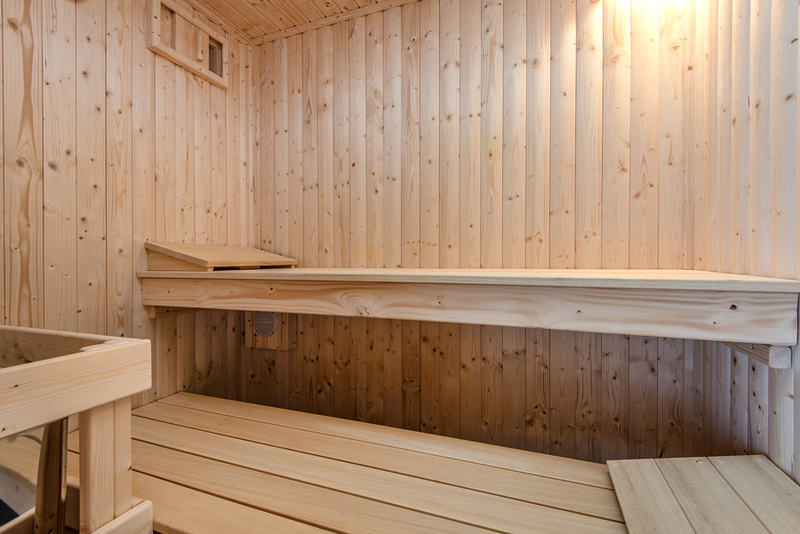 Sauna room – this is the darkest room and has a sauna suitable for 3-4 people. 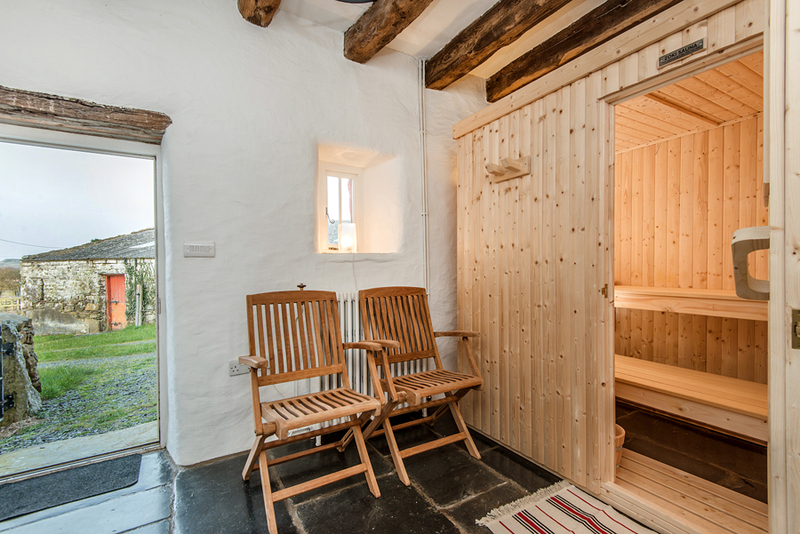 There is ample headroom in this room – about 8 ft with good access to the sauna. Attached to this room there is a door leading into the wet room which has an electric shower, wc, whb and radiator – the door is about 26” wide and 69” high. Leading up from this room to the upstairs is a narrow staircase with a 180 degree turn just over half way up. The stairs is steep and awkward in places with a light fixing on the wall. There are 12 steps and vary between 23” and 35” in width – the widest steps are at the top end of the staircase and vary between 8” and 10” in height. There is a handrail which runs the full length of the staircase. Under the stairs there is a storage cupboard which is locked and used by the cleaners only. The room at the top of the stairs is the detached fourth bedroom which is separate from the rest of the house. This bedroom has a king size bed. It is light and has an outside door leading to a staircase which runs down the back wall of the stable next to the pigsty. This room has awkward access from both entrances. In the main house the first floor is accessed by a staircase with a 180 degree turn half way up which has a landing area at this point. It is about 2 ft wide and of average accent. 6 steps lead up to the landing area and a further 6 steps lead to the upstairs landing after the 180 degree turn. All the steps are about 8” high. The upstairs landing area in the main house extends into a passageway leading to 3 bedrooms, a bathroom and an airing cupboard. All the first floor comprises of wooden floorboards – some of which have uneven edges. 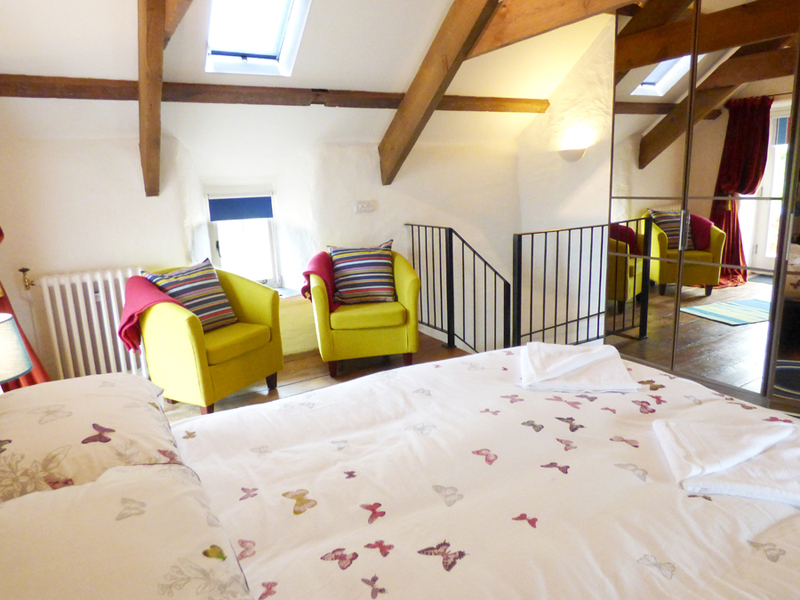 The rooms are light and well-furnished with plenty of space and headroom. All the doors upstairs are over 6 ft in height and vary between 2 ft and 33” in width. The airing cupboard door is narrower – about 22” wide and 6 ft in height. The first door on the left at the top of the stairs leads into the airing cupboard. This contains the pressurised tank and heating controls. There is some room for storage on top of the tank. The next door leads into the first bedroom which has a redundant fireplace. This room has a king size bed. 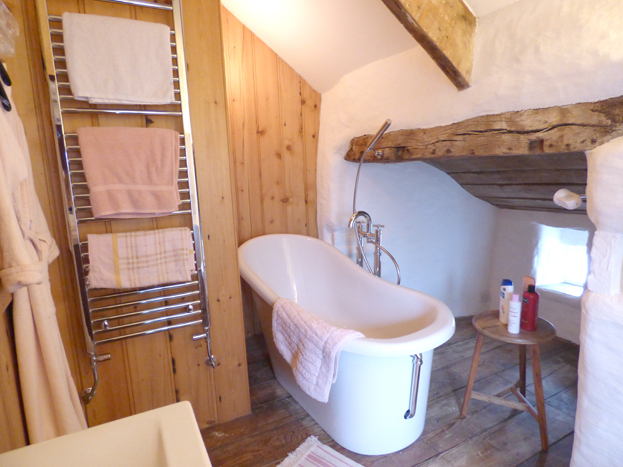 Leading off this room is an ensuite bathroom which has a bath, portable band held shower, wc, whb and radiator. 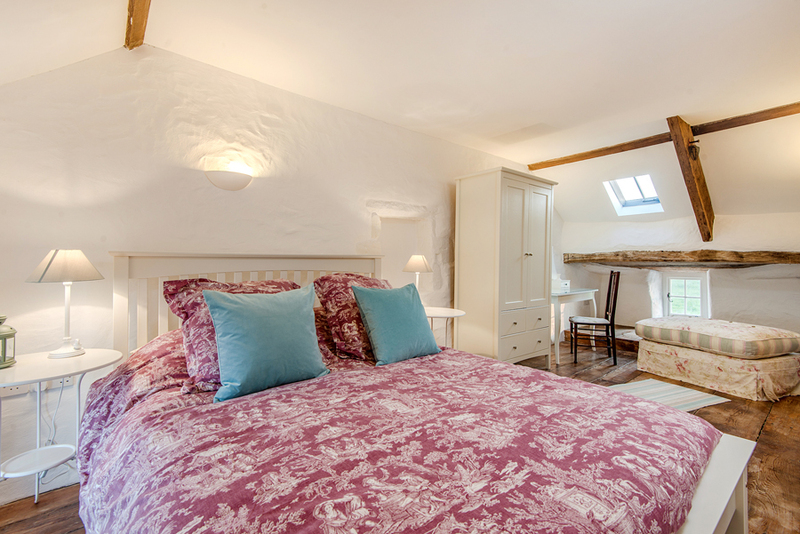 The next door on the left along the passageway leads into the second bedroom which contains 2 single beds. Opposite this doorway on the right hand side of the passageway is the communal bathroom which has a bath, shower, wc, whb and radiator with storage. 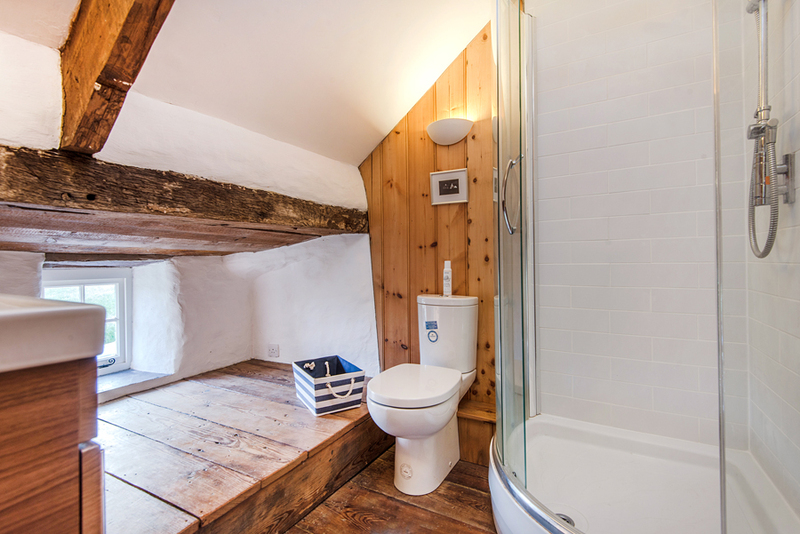 It is a small bathroom but functional. At the end of the passageway is the second main bedroom. 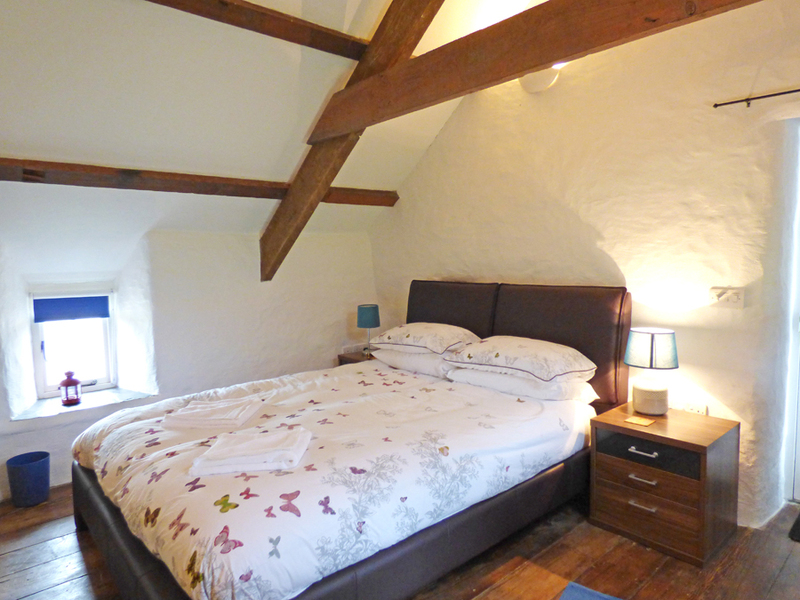 This room has a king size bed with a doorway leading to an ensuite which has a large delux shower, wc, whb and radiator. There is overall good contrast to floor, walls and doorways throughout the property most of which are amply wide. All rooms in the house have good headroom which varies throughout the house, whilst the doorways may be a bit restrictive. Antislip rugs are scattered throughout the property. 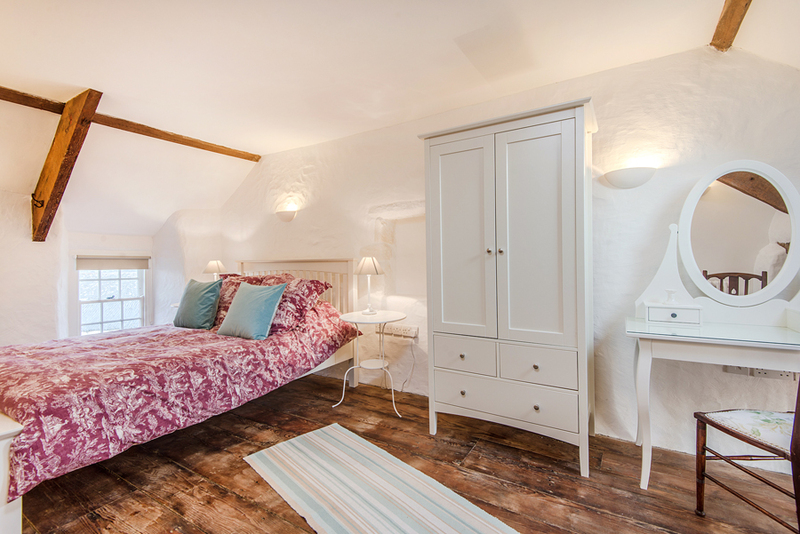 There is ample storage space throughout the rooms in the property for luggage including coats, shoes and clothes. The telephone is situated in the main lounge – available for incoming calls and emergency outgoing calls only. Mobile phones do work in parts of the property, but check with your network provider over coverage in the area. Free unlimited WiFi is available, the best signal available in the main lounge. There is outside storage for bikes in the middle shed marked red. There is combination of outside lighting. 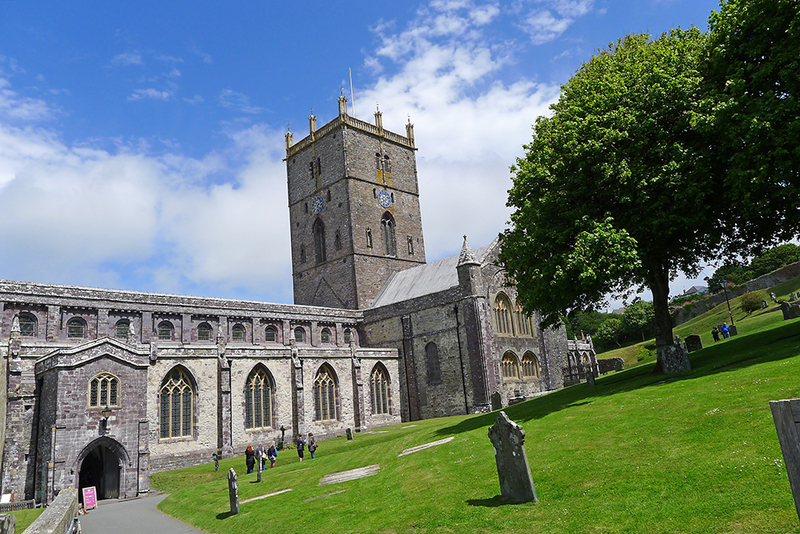 Public transport – nearest St Davids – approximately 2 miles. During the summer months a bus shuttle service runs past the property. 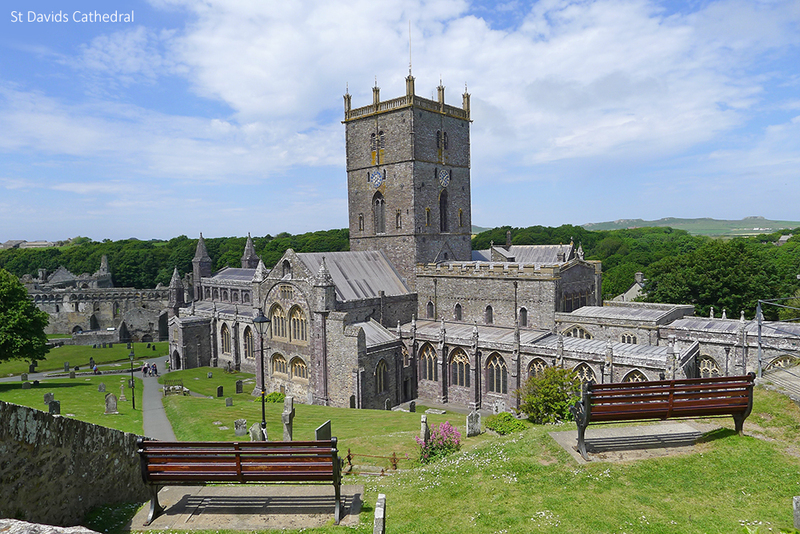 It can stop outside and runs into St Davids regularly every day. 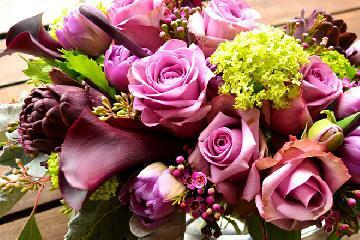 How would you like to contact us about Rhosson Farmhouse ?